A native of Arizona, Greg Campbell has been working with wood most of his life, from carpentry to art. The art phase of his woodworking began around the late 1980s when he discovered his passion for seeing what a piece of wood had to offer. Greg jokes that he has never met a tree he didn't like. He uses a variety of wood from exotics to trees found locally. Using wood from trees that are being removed for development or that have been felled by Mother Nature gives Greg the most pleasure. 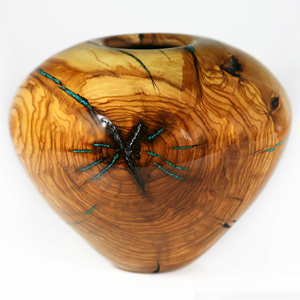 "The history of wood used in each piece makes if all the more interesting," states Greg "and knowing that I have created something lasting from each tree gives me great satisfaction."